For one to rule, one must fall. Elizabeth I, Queen of England, must decide the fate of her cousin, Mary, Queen of Scots, imprisoned and accused of treason. These historic characters sit center stage for CST's current production of Schiller's Mary Stuart, in a new version by Peter Oswald. 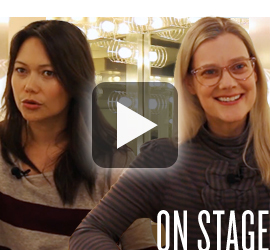 During rehearsals, Chicago Shakespeare sat down with actors K.K. Moggie and Kellie Overbey, who portray Mary Stuart and Elizabeth respectively, to discuss their approach to these dynamic female leaders. Director Jenn Thompson’s thrilling production runs in Chicago Shakespeare’s Courtyard Theater now through April 15. Earlier this winter, CST opened the doors of The Yard to students for its latest abridged production, Short Shakespeare! A Midsummer Night’s Dream. The show is helmed by Jess McLeod, who returns to CST after serving as assistant director for Gary Griffin’s production of Gypsy in 2014. 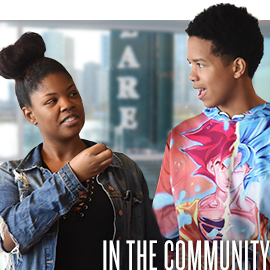 In past years, Chicago Shakespeare has been proud to serve 40,000 students and educators each year; now, with an extended seven-week run in The Yard, this annual program will engage thousands more than ever before. Following its performances on Navy Pier, Midsummer heads out on the road, touring to Chicago Public Schools across the city. Since CST launched its first student matinees more than twenty-five years ago, the Theater's education programming has impacted the lives of more than two million young people. 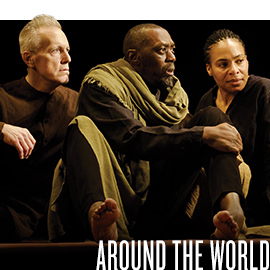 Over the years, the work of acclaimed international artists Peter Brook and Marié-Hélène Estienne has been presented as part of CST’s WorldStage series. The Theater’s international partnerships like these provide opportunities for Chicago artists to be exposed and introduced to the greatest theater makers of our time. While touring Chicago with their 2002 production of Le Costume, Brook and Estienne were introduced to Karen Aldridge; during their 2017 presentation of Battlefield in a co-production with the Museum of Contemporary Art, they met Larry Yando. Both have now joined the cast of the upcoming tour of Battlefield, the thrilling 70-minute adaptation of The Mahabharata, introducing audiences across five European countries to two of Chicago’s most accomplished actors. 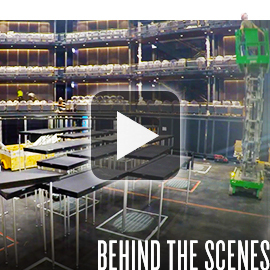 Since cutting the ribbon in September, The Yard at Chicago Shakespeare has been hailed as “the greatest new theater in the world” (Chicago Tribune). We are proud to introduce audiences to our third theater, one as forward thinking and responsive as the Theater’s own artistic spirit. In its inaugural season, The Yard will be configured as five unique performance spaces, tailored to the artistic needs of each production: in its largest configuration of 800 seats for French artist James Thierrée’s The Toad Knew, to the 350-seat cabaret for the Q Brothers’ irresistible holiday “ad-rap-tation,” Q Brothers Christmas Carol, to the current configuration for Short Shakespeare! A Midsummer Night’s Dream—a Shakespearean-style thrust theater that holds 600 audience members. Concluding this season is the much-anticipated production of Macbeth; directors Teller and Aaron Posner have set their magical psychological thriller in a 700-seat proscenium stage theater.